Spider Hickman passed away May 5, 2018 at home. Dave Dickoff updated his recollections (video) to include his connection to Ralph (the last six minutes are the update that relate to Doc Matkin). And here are Ralph's original recollections. - Updated roster page to include all 1,200+ names that are currently known. We are saddened to hear that Jim "Zut" Davis died May 11, 2017. 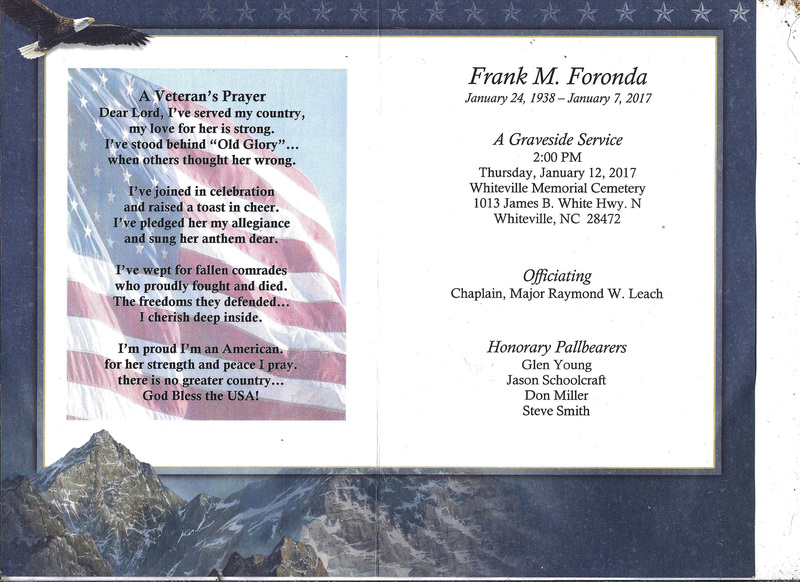 Frank Foronda - Frank died Jan 7, 2017. For all of you who have not yet done so,and who would want to contact Frank Foronda's wife LJ to express their sympathy/condolences may do so by email or text.Her email is ljhurley13@gmail.com or text her at 843-330-6552. Frank's obituary and funeral prayer. Dan Cooke passed away from prostate cancer late February 2015. Dan served in Charlie Company 1969-1970 and was from North Carolina. He lived in Newton, NC. This is from Bob Frederick @flickerbob@neo.rr.com. David passed away February 9, 2014 per 506infantry.org. Dale passed on May 11, 2014. Those who attended recent reunions at the Aaron's had the opportunity to get to know Dale in a pleasant atmosphere. Charlie 1-506th Infantry: Vietnam Chronicle, 1967-1971 is now available on amazon.com. Just search for the title or author - William Higgins. Bruce and Brenda Aaron again hosted a great reunion at their home in New Castle, Indiana. Even the weather cooperated so that the helicopters would have had no trouble flying. Between the large breakfasts at Stacks Pancake House and the food at the Aaron's, we all gained a pound or two. Attendees included: Mike Ball, Steve Lewis, Steve Mounce, Bruce Aaron, Dale Shatzberg, Jerry Brenke, Sergio DeCarvalho, Mike Redlin, Tom Wild, Matt Budziszweski, Bill Baumberger, Jerry McGee, John Georgiton, Mark Smith, Bill Clous, Buzz Dombrowski, and Bill Higgins. Chuck passed away from lung cancer on May 28, 2013. Our deepest sympathies are with Julie and the family. 2012 Charlie Company Reunion in New Castle, Indiana. The reunion will be held July 6 through July 8th at the Aaron's home in New Castle, Indiana. The 506th held its annual reunion in Early May in Columbus, Georgia. Some photos from Charlie Company attendees are here. Justin Bond is from my home town and is a member of our local VFW. He is a disabled US Army Vet and will be traveling across the US on a Segway with other Vets. It starts April 1. His organization, Our Heroes Dreams, is doing an outstanding job of working with Veterans from all wars and helping those that need it to get back on their feet. Please check him out his and if you are anywhere near the route he will be taking stop by and say hello and even lend any support you can to help and encourage these guys in the great work they are doing. Please make sure as many others as possible know about this and help make it a success. If you have any contacts with the press, radio and television along or near the route they are taking please make them aware of this event. The 506th Infantry Organization will hold its annual reunion in Columbus, Georgia in May 2012. Mark "Zippo" Smith will be a speaker at the reunion - Mark commanded Charlie Company from late March 1970 til September 1970. Edwin Murray found the web site in February. Edwin served from November 1968 to November 1969 in the second platoon. His tour placed him in several hot spots: Hamburger Hill in May 1969, Ashau area in June-July 1969, Hill 996 in August 1969 and the rockpile by the DMZ (Oct 69) to complete his tour. Edwin resides in West Columbia, South Carolina. Edwin provided a set of CIB orders dated December 10, 1968 which added about 25 new names to the roster which we did not have previously. Edwin also furnished several photos of his time in country (these are at the end of the "Men" photos section. Dave Dickoff checked in at the end of February. Dave had looked for Charlie Company on the internet in years past and recently found our current web site. Dave is doing well in Beaverton, Oregon. He is married with two daughters and three grandchildren. Dave served from January 1970 until March 1970. He was wounded on Firebase Granite and after hospital stays in Japan and Tacoma, was medically discharged. We were saddened to hear that Roy Breternitz passed away on January 10th. Roy was having neck surgery and did not wake up afterwards. Here is Roy's obituary, eulogy, and comments from Diane, his wife. Added a recollection from Danny Walker in the people / recollections area of the web site (June 2011). Dan visited Viet Nam in November 2011 and plans to return in March 2012. Here are some pics from his November trip as well as some comments. Ed Miller's wife just informed us that Ed passed away on Febuary 14, 2011. We are sorry to hear that Rick Marshall passed away January 28, 2011 in Parkersburg, WV. Our thoughts are with his wife Sarah and his family. Blackie Mitchell had been able to visit a few days prior to Rick's passing and others attended the funeral. Johnny R. "Spud" Smith said that a case he had begun several years ago with the VA is coming to what he hopes will be a successful conclusion. A few of us have provided statements about his time in the bush that will assist the VA to arrive at the best decision. Danny Walker found us through the web site. He was in Charlie from August 69 until February 1970 when he transferred to the 158th Aviation Battalion. Email whiggins11@verizon.net for contact information. Gilberto Del Valle found the web site; he came from the 9th Inf Div and was in Charlie from August 1970 to December 1970. He says his memory is not so good - perhaps because at a standown BBQ and after a few drinks, he got in the ring with a golden gloves guy and was clobbered! John Radcliffe from Toronto Canada provided some of his photos. They are at the end of the "men,", "hardware," and "firebase" photo sections. I'm not clear yet whether John was a Canadian in the US Army or Canadian Army or a civilian. John has had MS for the past ten years so keep him in your thoughts. Ron Marks provided some of his photos which are toward the end of "the men" section. Some newer photos of Zippo at Ft Benning are in the reunions / current photos section. I just talked with Sarah Marshall,and she said that Rick is doing pretty good.He can stand but still can't walk yet,but his appetite is a bit better. He really wants to leave the nursing home but that will be at least two weeks away,at the soonest.